JJ Abrams' other show, Alias, has a main character named Sydney. The flight in Lost was coming from...Sydney...just a coincidence!? Hmmm I coulda sworn I saw moving water at the bottom of that cliff. Either way though they could have boiled the water. Yeah there was water in the streambed...it wasn't a rushing river, but it wasn't completely dry either. As far as Charlie's taped fingers...read page 28 of next week's TV Guide, it talks about the tape and letters. the comic book Walt was reading in episode 2. It says eagle-eyed viewers could have noticed a picture of a polar bear on the page he was reading. When asked if it was coincidental to them seeing a real polar bear on the island, Lindelhof says "every prop is absolutely intentional"...it goes on to say the comic was a Spanish translation of "Green Lanter/Flash:Faster Friends Part 1" where the heroes attack an alien that turns out to be peaceful...says Abrams "We definitely chose that story for a reason"
I think the previous post should have been marked as a spoiler alert! Probably not, but there is quite a few tons on aluminum and all sorts of other things that can be used for many uses, heck, there is enough electrical cable in those planes to wire the island for cable TV. If they could find it, the coffee pots would work very well for boiling water. I still have all the episodes on my TiVo so I checked. It was Fate, and he put it on while on the beach, he never had it on while on the plane. Did he have HATE on the plane? I'm pretty sure he had something written on his fingers on the plane. Oh and you didnt have to be "eagle-eyed" to catch the polar bear on Walt's comic . Had a crazy thought while watching the "White Rabbit" episode - What if Kate killed Jack's dad?! I thought he had a coronary due to the alcohol abuse..
My friend just had an interesting idea. Could the island be located in the Bermuda triangle? I'm not sure a plane originating in Sydney could even get to the Bermuda triangle without refueling. They were over the south Pacific. Even if it could, that would be like the entire flight to LA plus, what, about another 6 hours of flight time? You're assuming a linear space-time continuum. Yes, I suppose I am... Did anyone see the Tardis? Now we're talking. , additionaly, if you punched a hole through the planet from where they are you might come up close to the Bermuda Triangle. Don't you wish there were a knob on the TV to turn up the intelligence? There's one marked "Brightness," but it don't work. What was it on the plane? He had something written on his fingers while on the plane didnt he? His fingers were not taped on the plane. He did that on the beach the first night. In the flashback, you see a closeup of his hand, nervously twisting the ring. It is large and silver, with the letters DS on it, presumeably for the name of the band he is in, Driveshaft. The other notable thing is that his fingernails are black in a thin crescent along the cuticle, if I have my terms right. This may be residual from his drug use, but strangely, it's only on the fingers of his right hand, not the left. 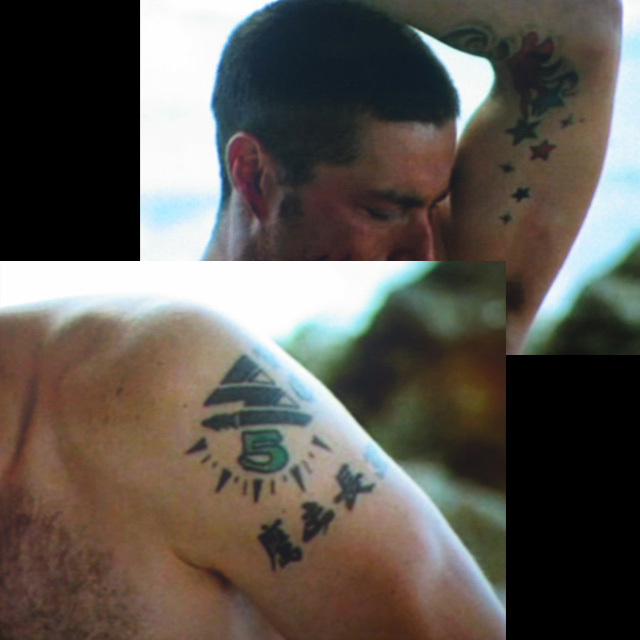 During one of the first scenes in the Pilot, where Jack is being sewed up by Kate and tells her the story of how he allows terror in, but for only 5 seconds, we see that he has a couple funky tattoos of his own...including the number 5. Wow, I completely missed those, is Kate in that scene also? So can anyone decipher the Kanji characters on his arm? I just have to echo that there is not an iota of doubt that Jack finished off the marshall. What's with Jacks Mom alluding to his past and why he owed her to look for his dad . What if the island has magical healing powers as in the wheel chair guy with the 400 knives getting up and walking . What if Jack's dad is a zombie now and his halucinations are not real but his dad is ? Remeber the coffin was empty !! I love the direction and flash backs adds real suspence and character development brilliantly done. The migration from waiting for rescue to realization that they need to form sociological order to survive reminds me of the book " Lord of the flies " only with adults . "If there was ever a show invented to take advantage of an HD DVR, LOST is it." yes it is and I am using one this show has me hooked already . or maybe that's just what they want you to think? Maybe the island fulfilled the marshall's wish before the doctor could? SURPRISE! and maybe the marshall was the "primary character" that was supposedly going to be killed? The surprise is there is no surprise! There's a message board on the ABC page and a guy claims that he freeze framed a few scenes where you could see the watches people were wearing and they all are stopped at 3:15, which lead to a whole bunch of bible quotes. Can anyone confirm this? Unless they dropped the ball on tonight's episode, I would say this is NOT the case. In the scene with Charlie and Claire, even though his watch is out-of-focus, you can see that the time changes dramatically from one cut to the next, even though only a few seconds have passed. Guess they must have reshot parts of that scene. Speculation - Jack turned his alcoholic father into the medical board for performing surgery under the influence. I think you're probably right. This ties everything together nicely (including Jack's encounter with his mother). Also according to the Guide, the black on Charlies nails is not due to drug abuse...it's because he likes black nail polish. "It's not a very strong drink." ...maybe it was foreshadowing -- hinting at familial tendencies? Maybe he is going through DT's. And we thought Charlie was the one with a problem! Maybe he was just trying to deal with a very traumatic situation and needed a stiff drink. I think if he were going through the DT's on the island it would have been within the first 2 days and he would have been very sick. No, they wouldn't. For safety reasons, the pots would have been the plastic insulated kind which can only be used with a drip coffee maker (which would require electricity). The outside of the pot would melt if placed too close to any significant heat.